The most frequently requested Christ in Prophecy television show episodes on Revelation have been pulled out of the vault and re-released! In the first three chapters of Revelation we saw that the basic purpose was to encourage the Church, then and now, to persevere and remain faithful to God's Word while waiting expectantly for the Lord's return. We'll continue on in our journey through the great book of Revelation next by going to God's throneroom in Chapter 4. Feel free to watch, listen, or read along by clicking one of the icons below. Dr. Reagan: With Chapter 4 the focus shifts from the Church to God the Almighty One. A door opens in the heavens and John is suddenly transported "in the spirit" from Earth to Heaven where he is ushered into the throneroom of God. I believe John's catching up to Heaven is a symbolic type of the Rapture of the Church. Notice verse 1, "After these things, I looked and behold, a door standing open in the Heavens, and the first voice which I heard, like the sound of a trumpet speaking with me, said, 'Come up here, and I will show you what must take place after these things.'" A door opens in the Heavens, and John is taken up to Heaven from Earth. The door opens again in Revelation 19:11 and through it comes Jesus on a white horse returning to Earth, and behind Him comes His Bride the Church. The clear implication is that the Church will be in Heaven with Jesus during the Tribulation. In this regard, I think it is significant that the Church, which is the focus of chapters 2 and 3, is not mentioned again by name in the book until Revelation 22:16. There is mention of "saints," but I believe these are the people who accept Jesus as Lord and Savior during the Tribulation. The blessing John was given of seeing the throneroom of God is a very special one that few other people have enjoyed. In fact, only five other persons are reported in the scriptures as having seen God's throne. They are the oral prophet Micaiah, the major prophets Isaiah, Ezekiel, and Daniel, and of course, the Apostle Paul. What John saw was similar to the reports given by these other men. John sees blazing light emanating from the throne. There is a rainbow encircling the throne, testifying to the faithfulness of God in keeping His promises. He sees seven lamps of fire before the throne, which he says represent the seven-fold nature of the Holy Spirit. 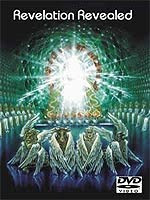 He also sees 24 mysterious elders kneeling before the throne, clothed in white garments. They have golden crowns which they are presenting to the Lord. They could very well be representatives of the Redeemed — 12 representing the Old Testament saints, perhaps the heads of the 12 tribes of Israel, and 12 representing New Testament saints, perhaps the 12 Apostles. John also sees "four living creatures full of eyes in front and behind." Each has a different face: one is a like a lion, another like a calf, the third like a man, the fourth like an eagle. These are probably the seraphim which Isaiah saw in his vision of the heavenly throneroom. These appear to be representatives of God's creation, and their role appears to be guardians of the throne and they appear to be worship leaders. Everyone John sees around God's throne appears to be caught up in worshiping the Father. They are singing praises to God. Consider the song recorded in verse 8: "Holy, holy, holy is the Lord God, the almighty, who was and is and who is to come." Notice the three attributes of God that are emphasized in this song: His holiness, His power, and His eternal nature. The purpose of the song provides encouragement to the Church during any time it is caught up in suffering and persecution. It is intended to remind the Church that God is on His throne, still hears prayers, still answers prayers, and that He still performs miracles. In short, God is in control, and He has the wisdom and the power to orchestrate all the evil of man and Satan to the triumph of Jesus Christ. What a comforting thought! In the next part on this series on Revelation, we'll join in proclaiming "Worthy is the Lamb!" in Chapter 5. Understand the book of Revelation! Revelation Revealed is a 75-minute survey of the entire book of Revelation and is full of charts, maps, pictures, historical footage and video animations. "could" repesrent the redeemed? no maybe about it. they`re seated on thrones(ep2:6)"we church)are seated in the heavenlies" we rule with him. they have crowns,promised to the church. they are kings and priests(the church) they have been redeemed(the church)o.t saints arent rewarded til AFTER the tribulation. but why 24 and not 12?